When they first drove onto the scene many years ago, SUVs were the vehicles of choice for adventurers searching for excitement off the beaten path. But today, they are a leading choice for families looking for a reliable vehicle with plenty of room. The GMC Acadia fits into that role nicely. The 2015 GMC Acadia did not undergo any changes from the 2014 model. The only difference is that GMC replaced two color options for the vehicle. Last year’s Atlantis blue has been replaced by dark sapphire metallic blue,and cyber gray metallic has been replaced by midnight amethyst metallic. Those looking for a family vehicle other than a minivan will love the size of the 2015 GMC Acadia and its roomy interior. With its three rows of seats, it can seat up to eight people. SUVs have come a long way in appearance since the first boxy looking off-road vehicles of years ago. Today’s SUVs have a more pleasing shape that make them attractive to many people. The GMC Acadia is one of those vehicles. Even though it is a large vehicle, the 2015 GMC Acadia handles well on the road. It provides a smooth ride even when traveling on bumpy roads. For those who need to carry a lot groceries, cargo, or luggage, the 2015 GMC Acadia could be the perfect vehicle. It has lots of cargo room, including an under the floor storage bin in the back. It can hold 24 cubic feet of cargo with all three rows of seats in place. It can carry an impressive 116 cubic feet when the second and third rows of seats are folded flat. When the snow starts to fly, or heavy rains move in, drivers will appreciate the GMC Acadia’s all-wheel drive. It makes driving in inclement weather much easier and safer. It also can be purchased with front-wheel drive. Drivers who spend their days commuting to and from work or going on long trips will enjoy the comfort of the 2015 Acadia’s front seat interior. The soft, padded seats are spacious and easy on the body, which helps reduce travel fatigue. Front seat passengers will also like this feature. Safety is paramount when traveling the highways, and the 2015 GMC Acadia provides a very safe ride. It received a five-star safety rating, which is the highest rank given by the National Highway Traffic Safety Administration. In the unfortunate event of an accident, those traveling in the 2015 GMC Acadia will be well protected by airbags. In addition to the usual front seat airbags, the Acadia has side curtain airbags along each of the rows. It also has a center airbag in the front to prevent the driver and front seat passenger from slamming together during a collision. Even the best drivers encounter those moments when a collision can occur. However, the 2015 GMC Acadia can help them avoid accidents with advanced technology. It is designed to warn drivers when a collision is likely to occur or when they are drifting into another lane. The radar-based technology monitors the driver’s blind zone and warns the driver if another vehicle is nearby. It also warns drivers if they are approaching another vehicle too quickly. Drivers can lose control of their vehicles in a matter of seconds, especially if they have to swerve quickly. But the 2015 GMC Acadia includes stability control technology that can help drivers maintain control in such a situation. In the event a driver swerves or jerks the vehicle quickly, the Acadia manages the traction control, braking, and throttle to help keep the vehicle traveling in the direction in which it is being steered. 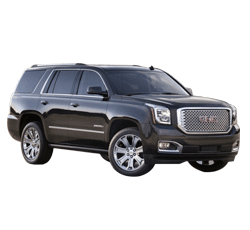 The 2015 GMC Acadia is a large and heavy vehicle. While it drives well on the road, it can be harder to maneuver in crowded parking lots or other tight spaces. The GMC Acadia comes standard with a V6 engine. Several reviews contend that it has ample power under most circumstances, but it can lose acceleration power when it has the maximum number of occupants. The 2015 GMC Acadia is reasonably priced for an SUV in its class, but it can still be expensive, especially if the driver wants a lot of optional features. The price ranges from $34,900 to $50,400. Drivers who are looking for a gas efficient vehicle may not want to buy a GMC Acadia. Considering that it is a large SUV, the 2015 Acadia gets modest gas mileage, but it is still low. It gets 17 miles per gallon in the city and 24 miles per gallon on the highway. The 2015 GMC Acadia competes well with other vehicles that share its class as a larger SUV. Other popular vehicles in this class are the Honda Pilot and the Toyota Highlander. While all three vehicles share a lot of the same options, safety features, and technology, the Acadia has more horsepower and is the only one that comes with a six-speed automatic transmission. It also has more headroom in the front than the other two. The 2015 GMC Acadia further has a better warranty. It has a 100,000 mile powertrain/drivetrain warranty, while the Honda Pilot and Toyota Highlander each have a 60,000 mile warranty. Overall, the 2015 GMC Acadia is a good vehicle, especially for families who want something other than a minivan. Its roomy interior, impressive cargo space, and advanced safety features make it a great vehicle for those who value safety and space.